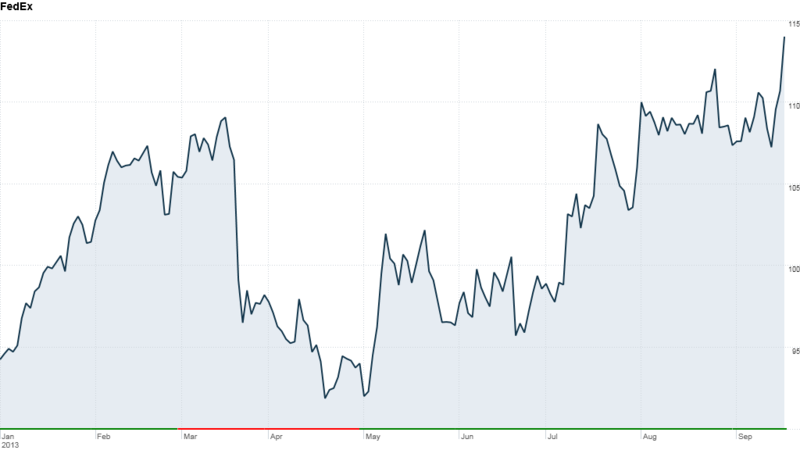 FedEx says global growth still "tepid"
FedEx stock up even though economy still "tepid"
Click the chart to track shares of FexEx. Business at FedEx remains solid and investors are pleased, but the shipping giant isn't very optimistic about the global economy. Though the company reported better-than-expected fiscal first-quarter earnings, FedEx CEO Fred Smith says the company continues to face "challenging global economic conditions." FedEx maintained its previous forecast of earnings growth between 7% and 13% for the year, but said it's basing that outlook on "tepid" economic growth: a measly 2.1% in the United States and 2.6% globally. That's even lower than what the company had predicted in June. In comparison, the International Monetary Fund expects the global economy to grow by 3.1% in 2013, and 3.8% in 2014. Shares of FedEx (FDX) rose almost 3% on the news. Shares of top rival UPS (UPS) were flat. The cautious outlook from FedEx, which is considered to be bellwether of the global economy due to its size and worldwide presence, comes on the same day that the Federal Reserve is considering to start scaling back stimulus measures that have been fueling growth in the stock market since the financial crisis. Although FedEx remains lukewarm about the global economy, the company also said it will raise U.S. shipping rates by an average of almost 4% beginning in 2014, a sign that it still thinks the economy is strong enough so that consumers will be able to withstand higher costs. And despite the sluggish economy, FedEx's earnings rose 7% increase while sales were up 2%.